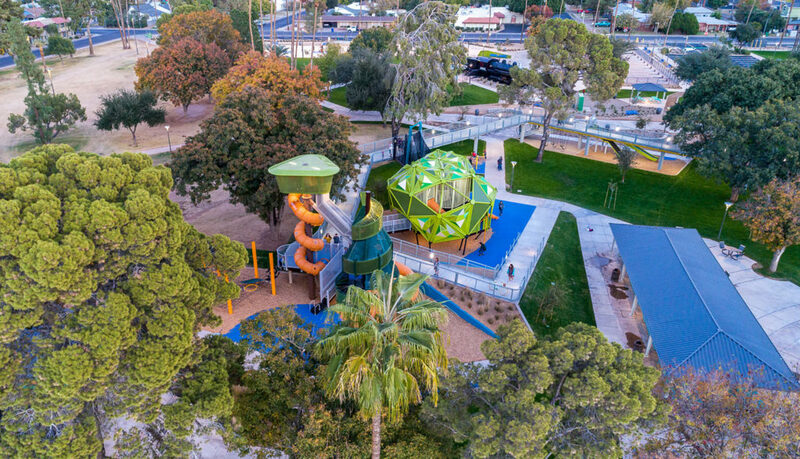 Dig Studio was charged with renovation of the park, balancing conservation and historic preservation while ushering in a new generation of fun. 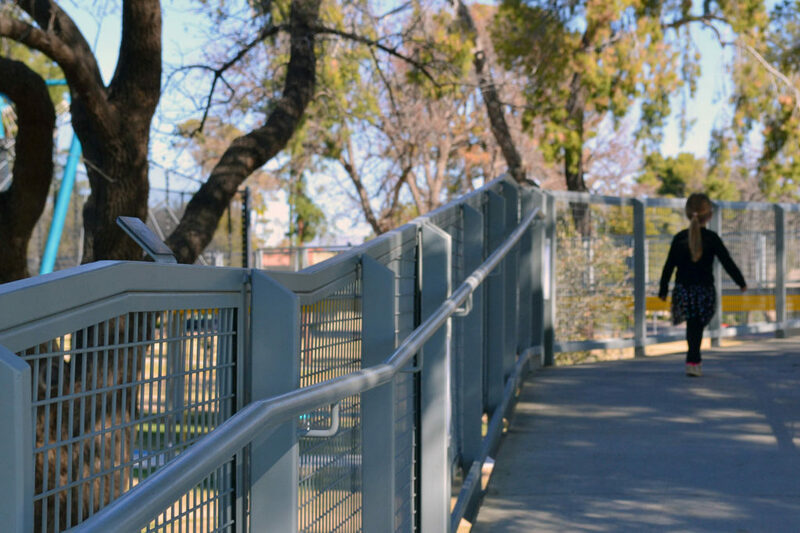 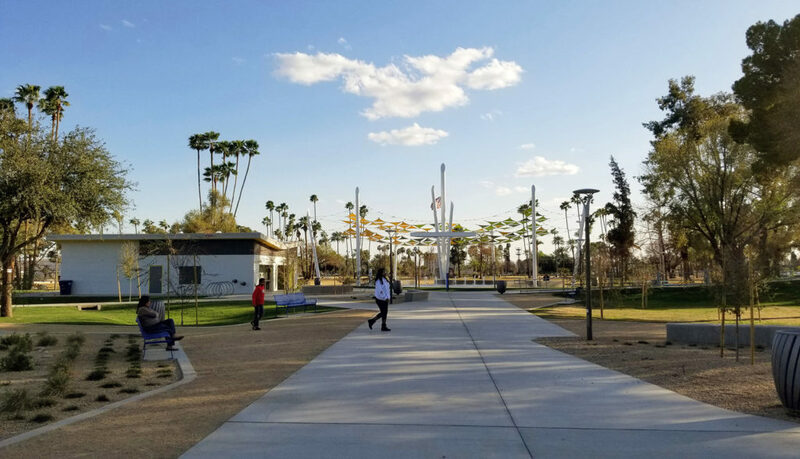 One major goal of the park was to ‘rethink play’ and study how the activity of play could become a tool to increase social interaction and build community. 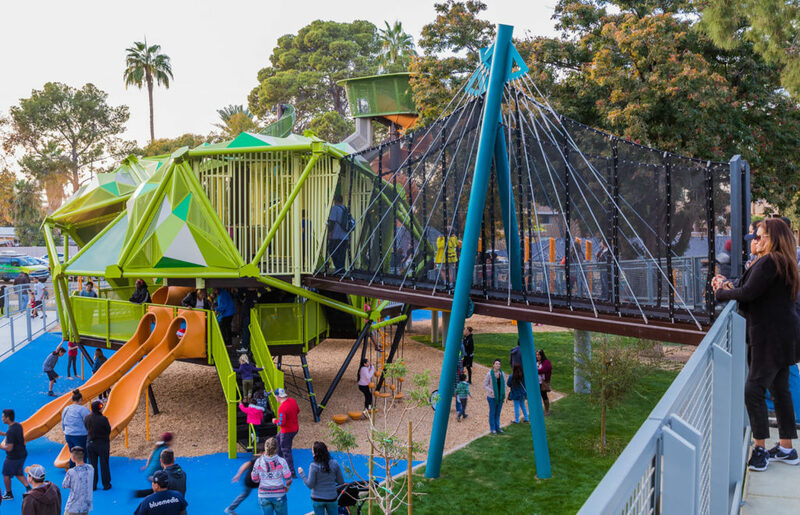 Driven by the idea to protect and celebrate the historic trees, Dig created an iconic play experience within the trees, elevating into an immersive tree canopy experience accessible along a 500-foot-long elevated ‘play connector’ walkway. 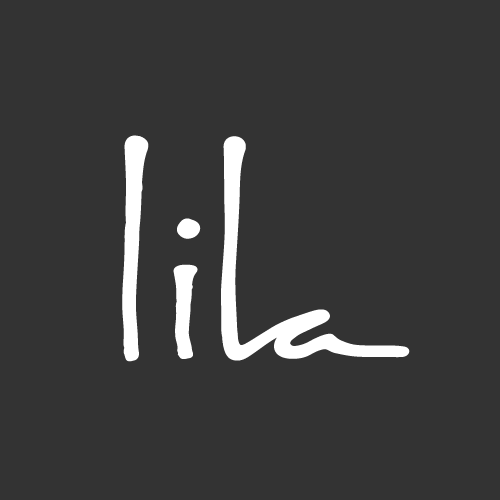 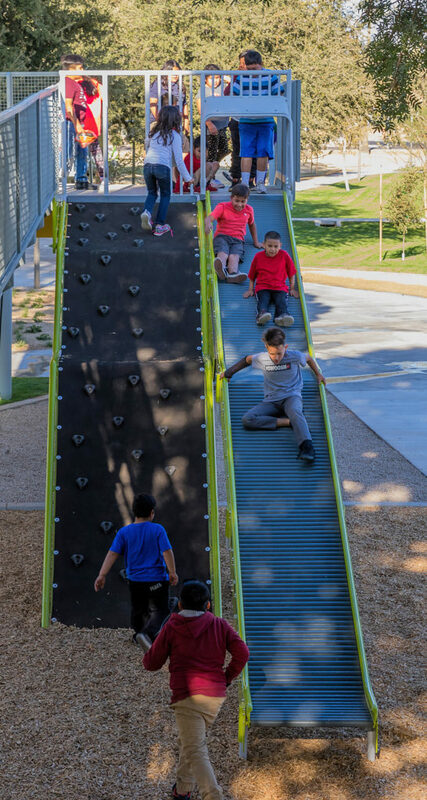 The ‘play connector’ experience is multifaceted. 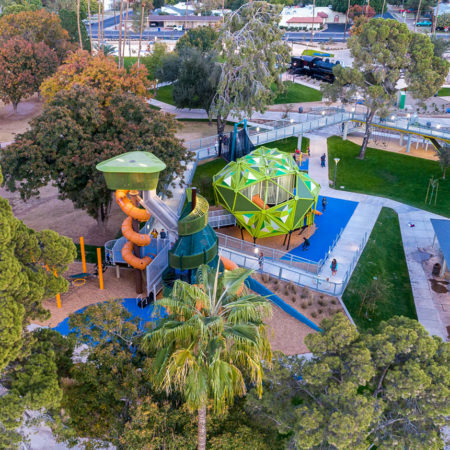 At once it provides a lofty path through the leafy canopies and a unique bird’s eye view of the park, while shading people and play elements below. 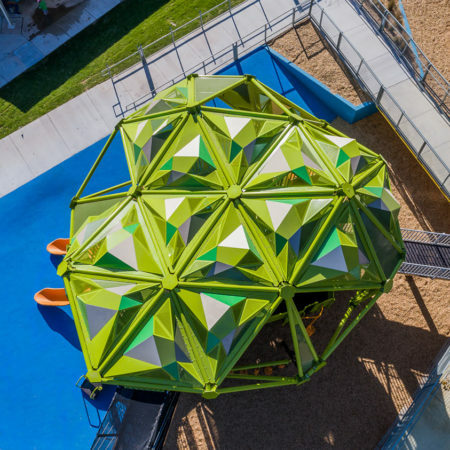 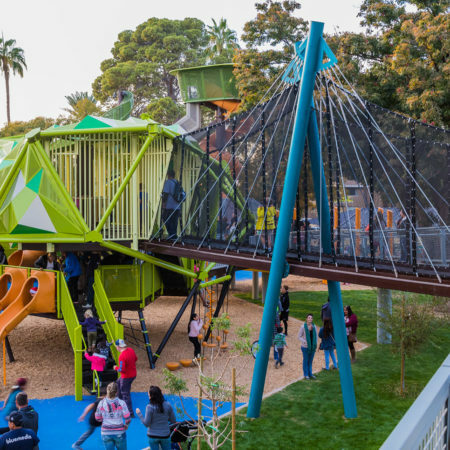 It also connects to the play structures on multiple levels providing ultimate accessibility. 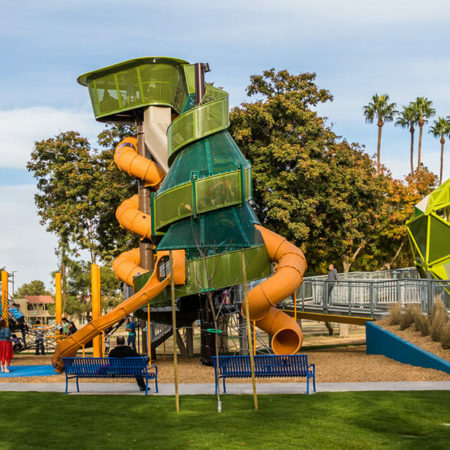 The distinctive form of the park’s giant pistache, billowing pines and towering palms were interpreted in the design of the custom play elements. 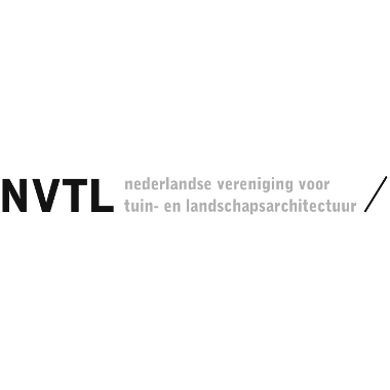 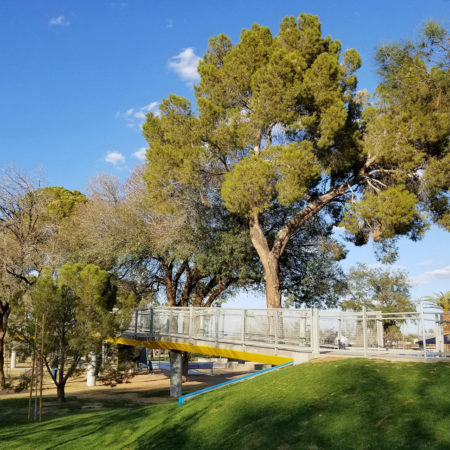 The trees directed the design in another way, in that all of the play elements and bridges had to be strategically sited to protect and preserve the root zones of these legacy trees. 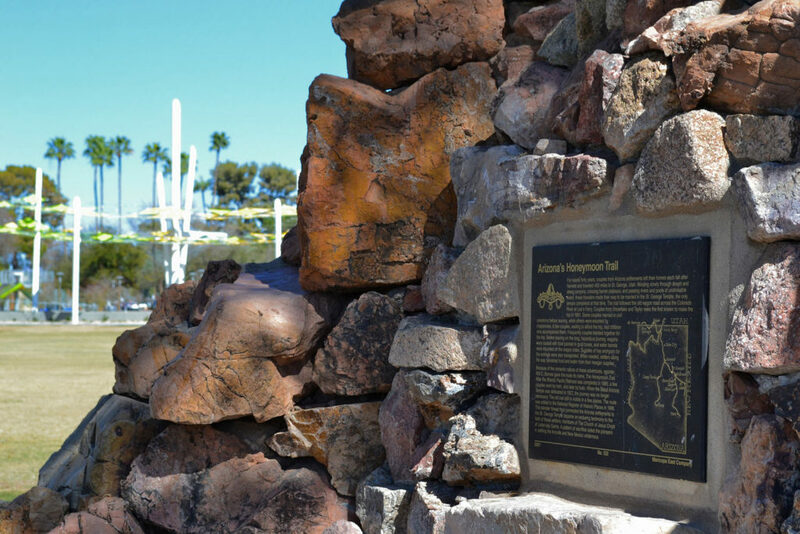 The historic use of flood irrigation was instrumental to the design. 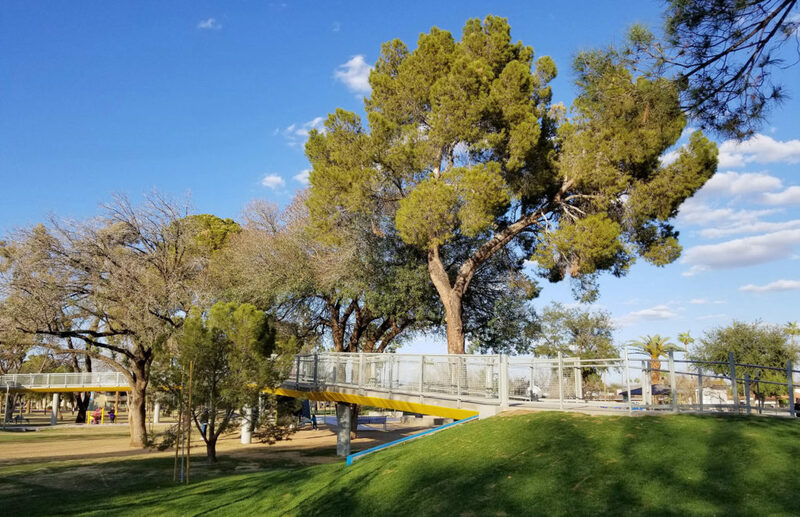 All grading had to preserve this effective system so that the trees would not be shocked by a drastic watering change. 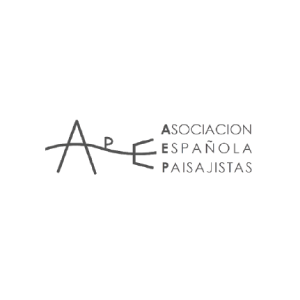 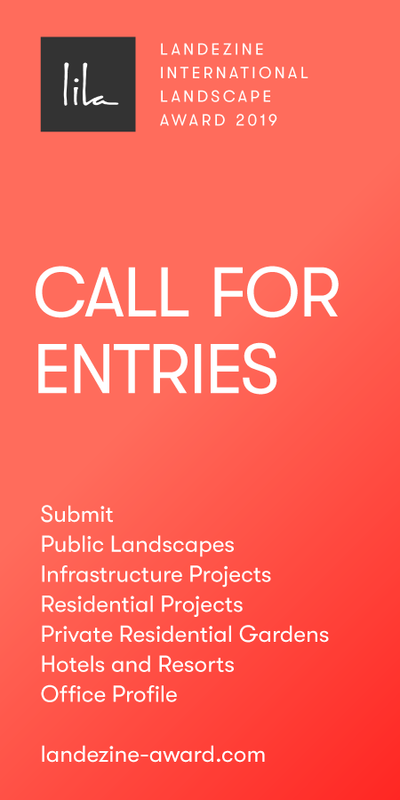 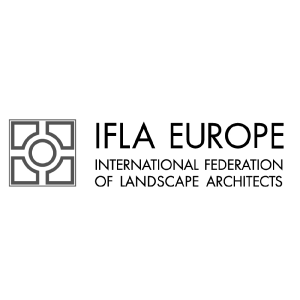 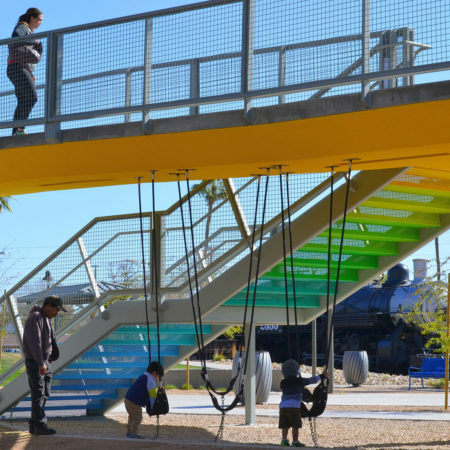 Intergenerational play and social interaction between user groups is encouraged through the blurring of programmatic barriers, the use of non-traditional play structures, and through disbursed spacing of play areas. 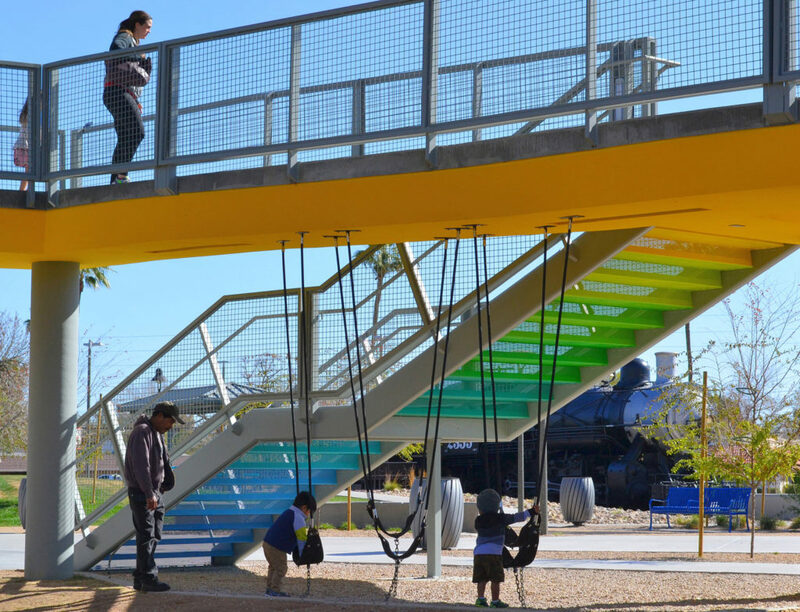 The layering of play elements among multiple levels encourages impromptu interactions. 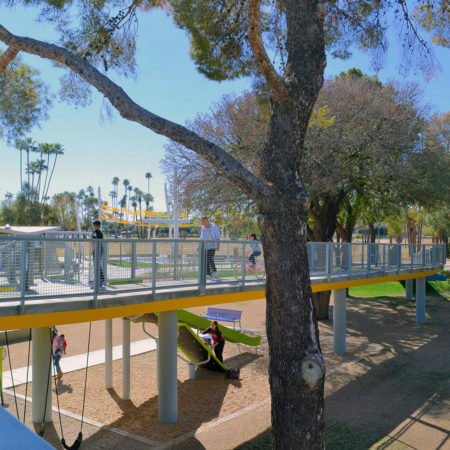 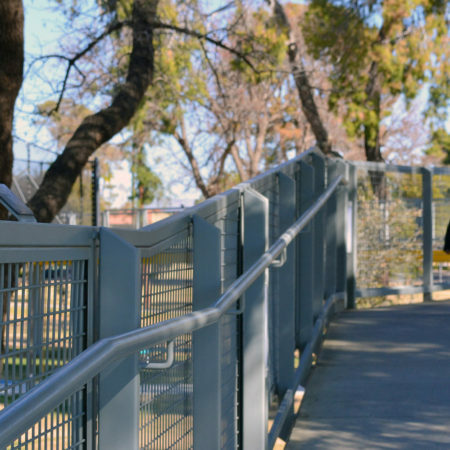 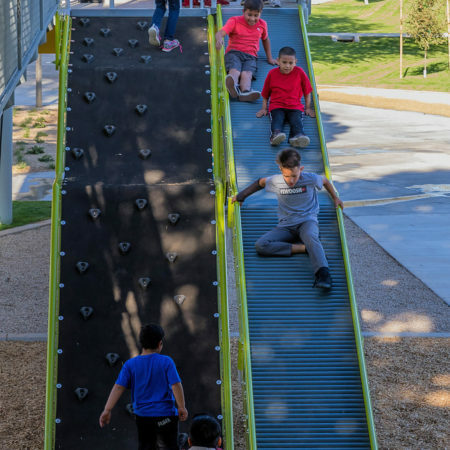 Slides emerge off the side of elevated pathways to prompt parents to take the ‘fun’ way down, while social swing clusters hang below the walk creating shaded seating areas. 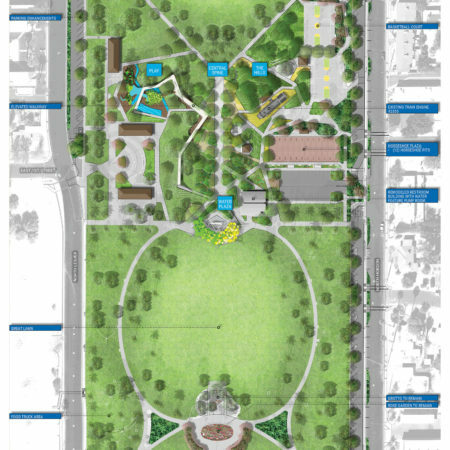 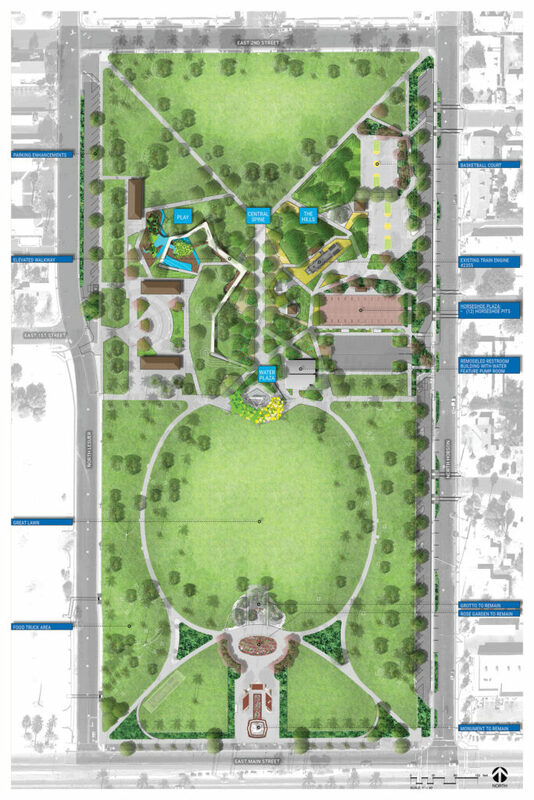 Dig designed an iconic splash pad to anchor the reconfigured central park axis and draw users in from Main Street. 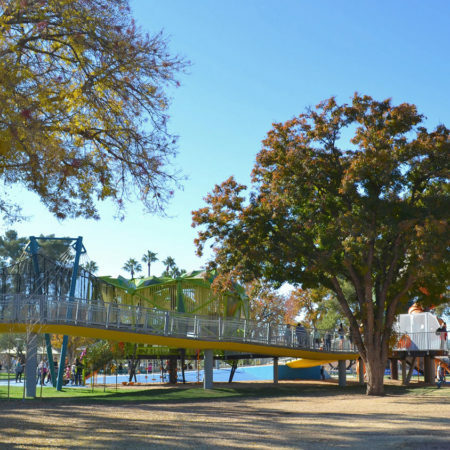 By siting the splash pad at a distance from the tree play structures, healthy movement between site features is encouraged. 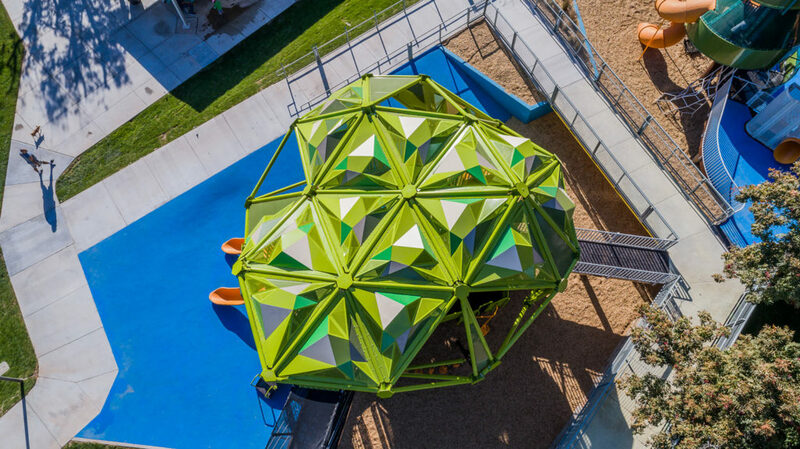 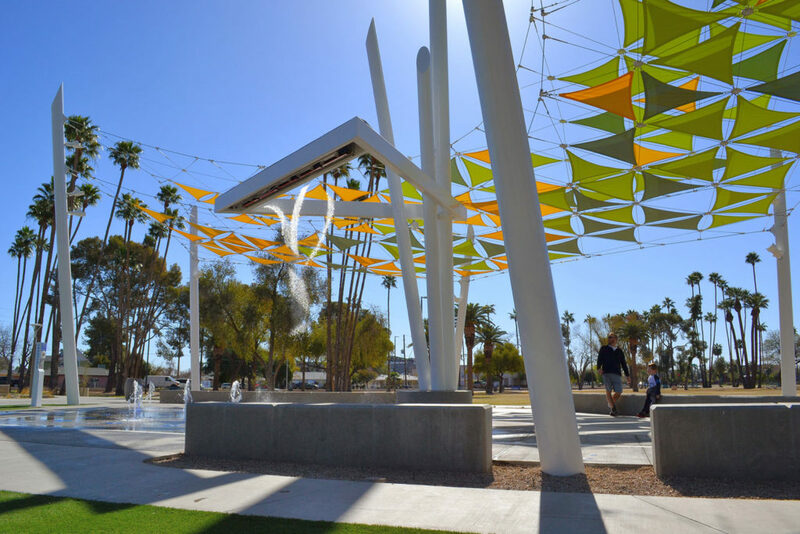 The splash pad’s engaging water elements are shaded by an tree-like structure of fabric sails providing dappled shade that are layered in a way that produces open, spotted shade during the sun’s low winter angles, and heavy consistent shade during the summer months. 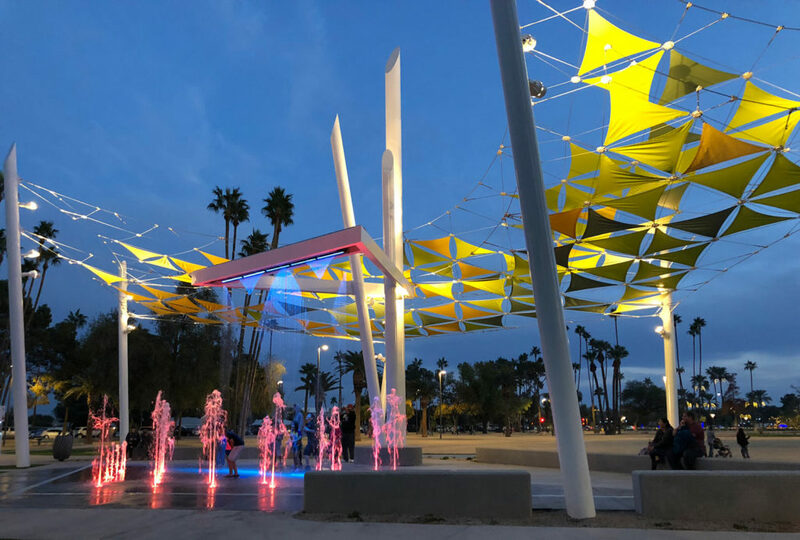 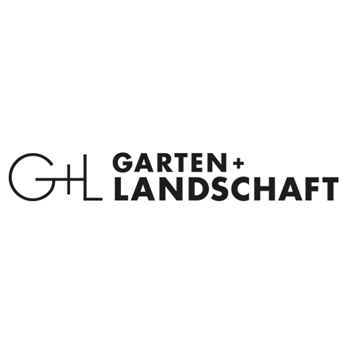 The shade structure supports a large cantilevered 15-foot high beam of water that dazzles viewers with programmed and interactive displays, creating a vibrant backdrop to great lawn events. 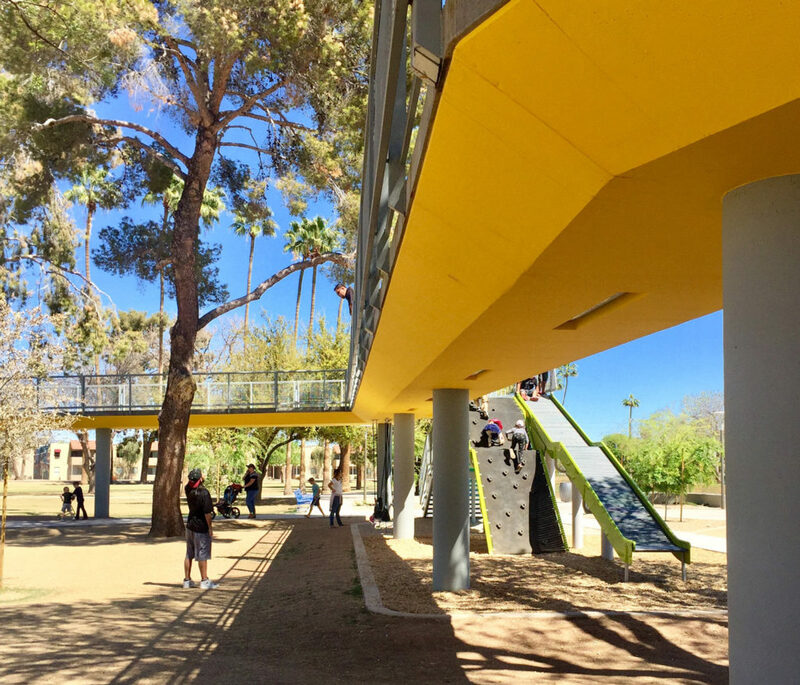 Pioneer Park has been embraced by a wide range of users. 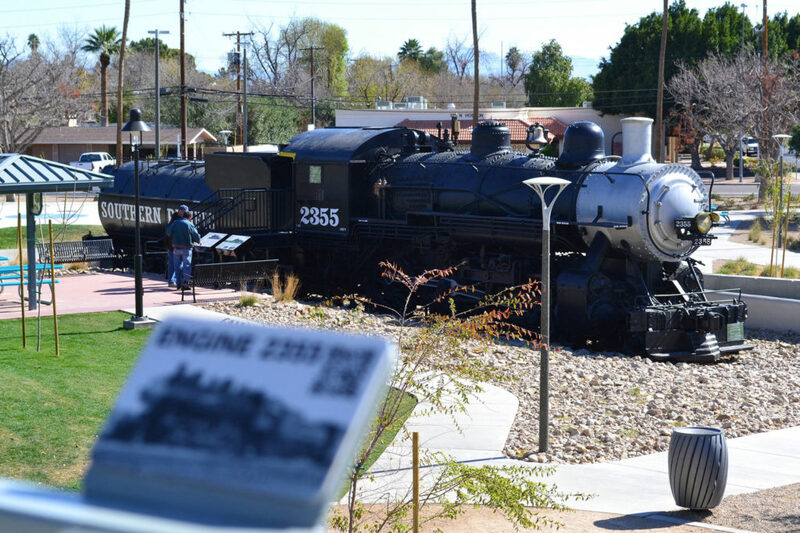 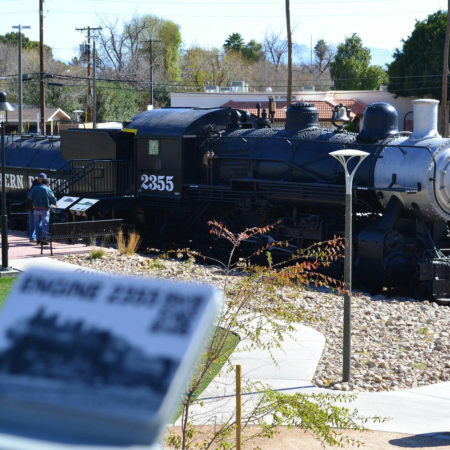 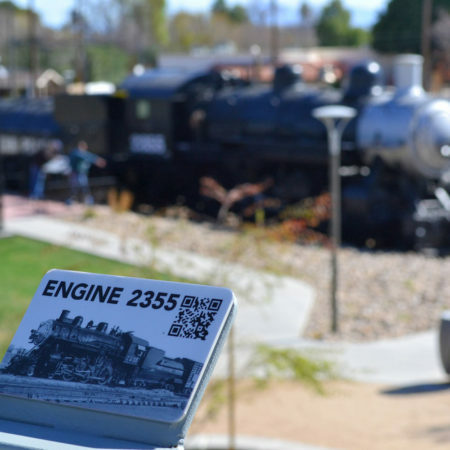 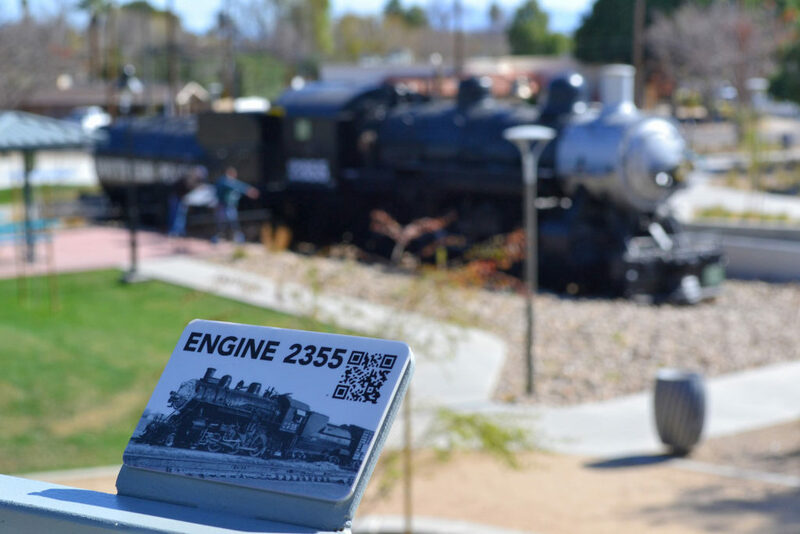 Certain elements like the historic Southern Pacific Train Car #2355 and the “Daughters of the Utah Pioneers” memorial have special significance to community members, who were actively involved in the meticulous restoration efforts during design and construction. 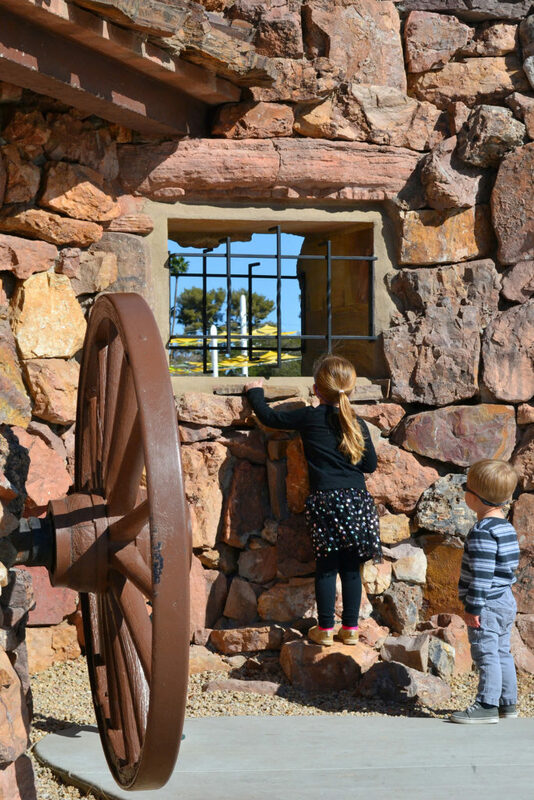 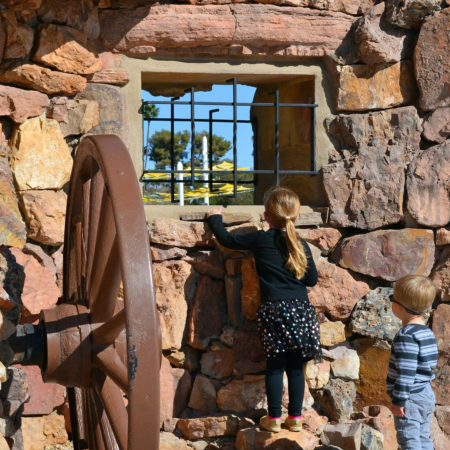 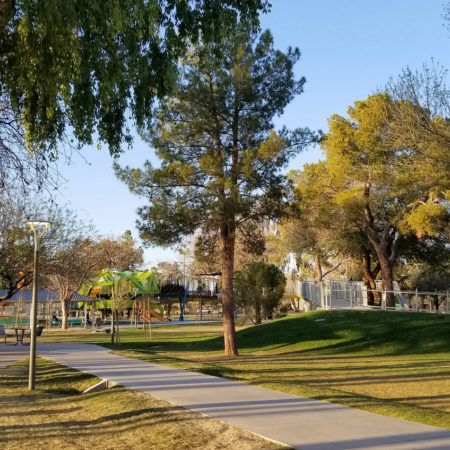 Events are planned throughout the year, including the weekly food trucks on Friday nights, the holiday Merry Main Street celebration, ‘Celebrate Mesa’ Earth Day, car shows and movies in the park. 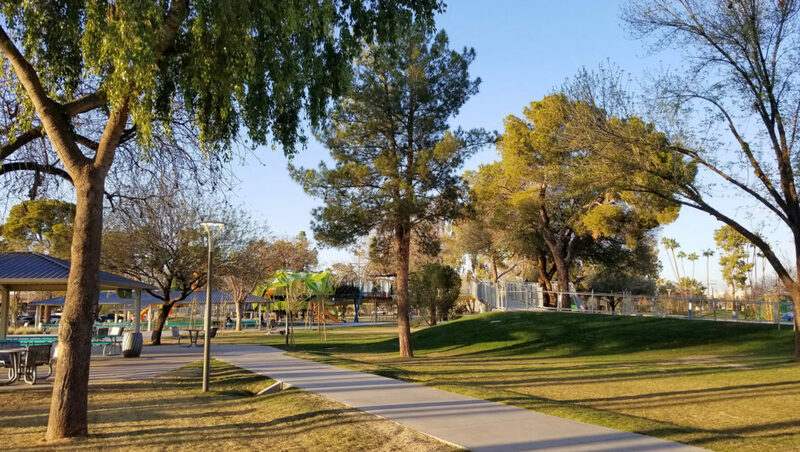 The community has taken ownership of ‘their park’, and this positive energy has driven away undesirable activities that took place there previously. 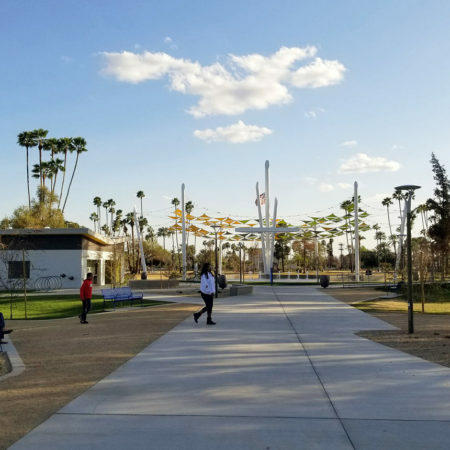 In a very short time, Pioneer Park is demonstrating tremendous success, which is extending into the adjacent community. 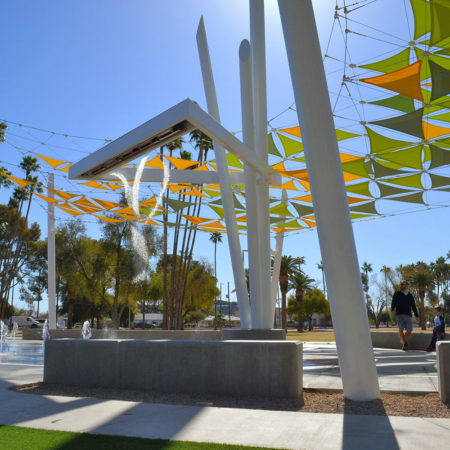 The unique park design supports downtown Mesa as a designated Innovation District. 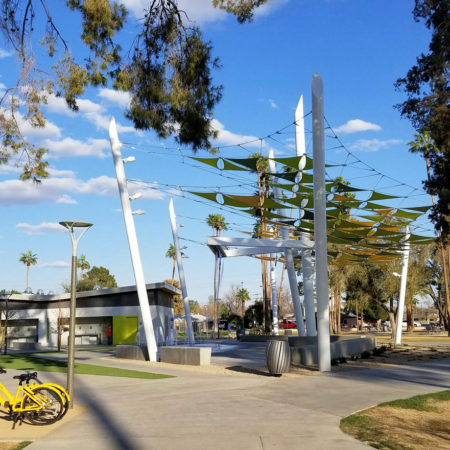 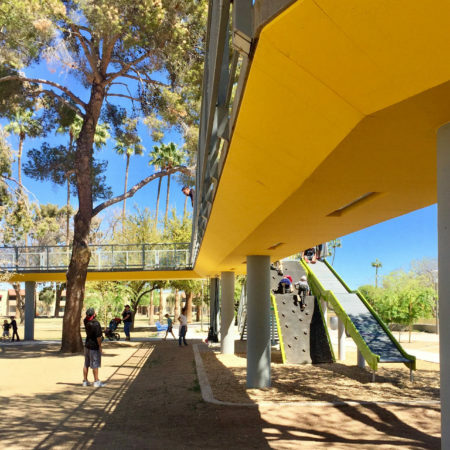 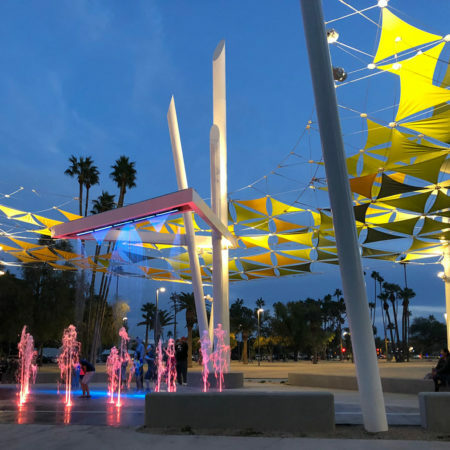 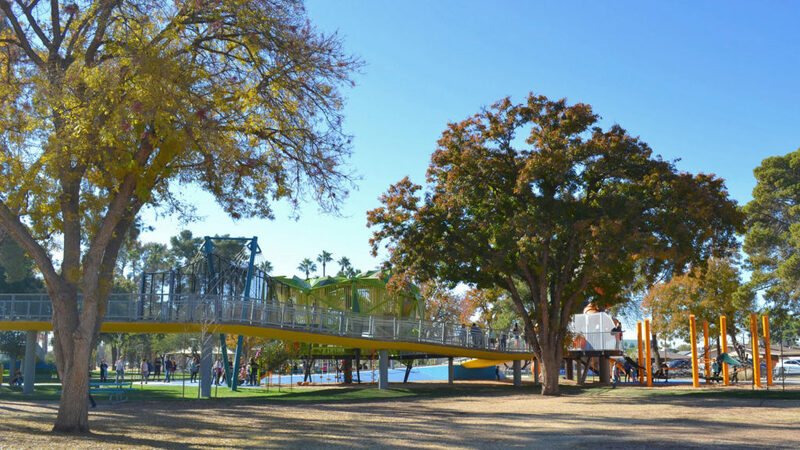 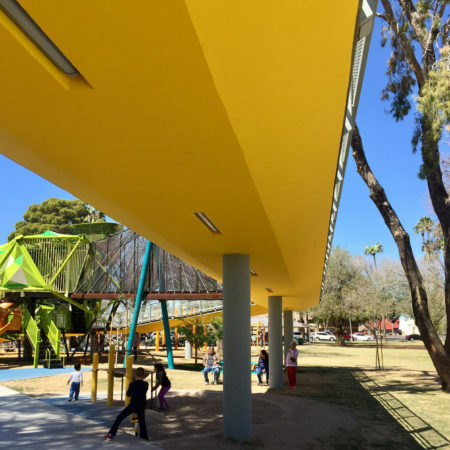 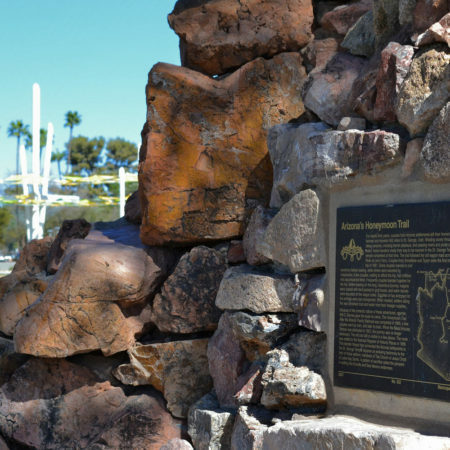 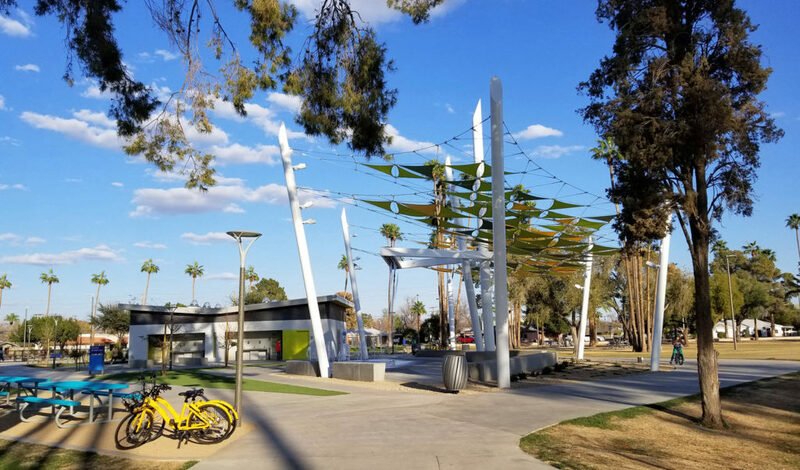 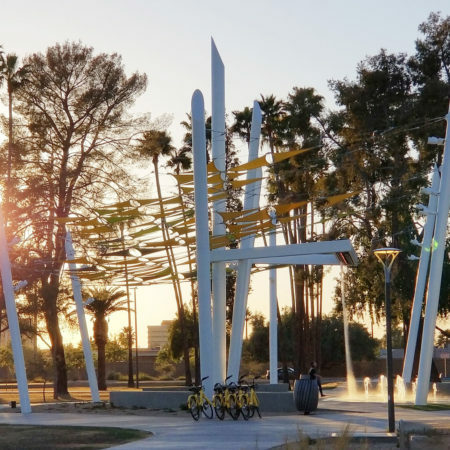 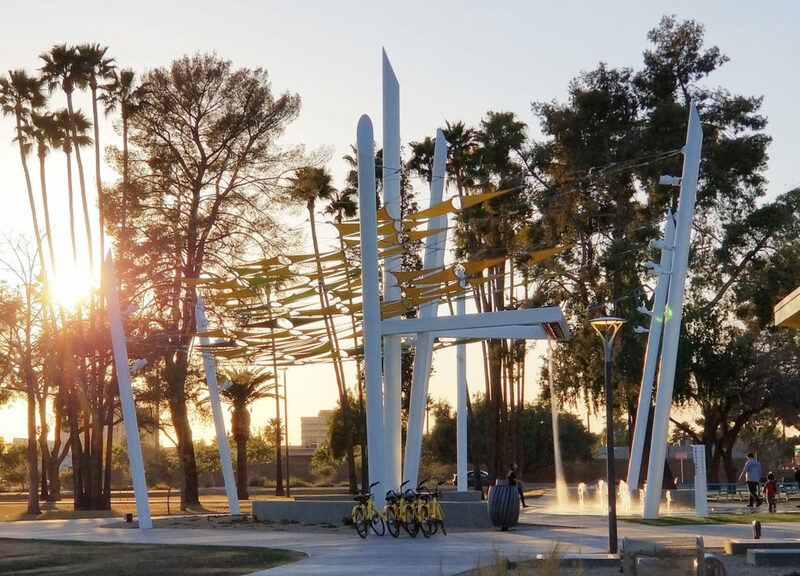 Without the commitment from the city of Mesa to restore their urban park, the vitality and vibrancy of downtown Mesa and the surrounding neighborhood would not experience the resurgence and reinvestment they are seeing today. 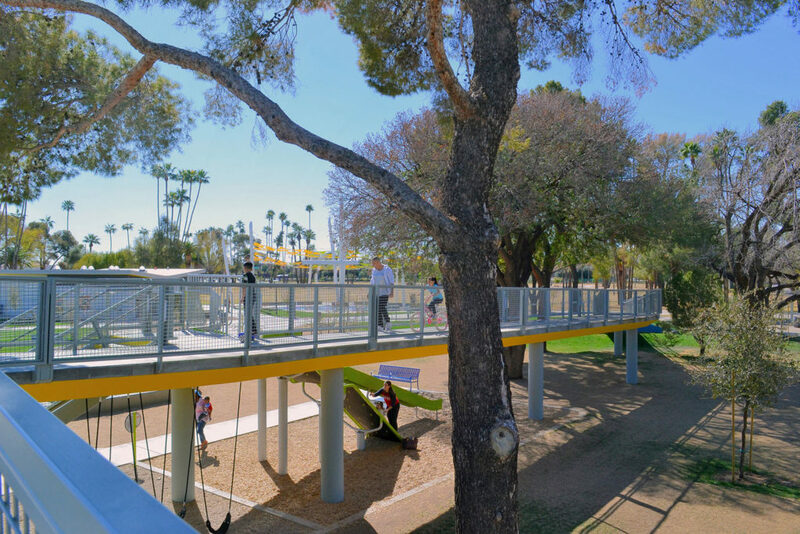 Entrant office name: Dig Studio, Inc.
Architekton: Collaboration on Walkway and Shade Structure Design. 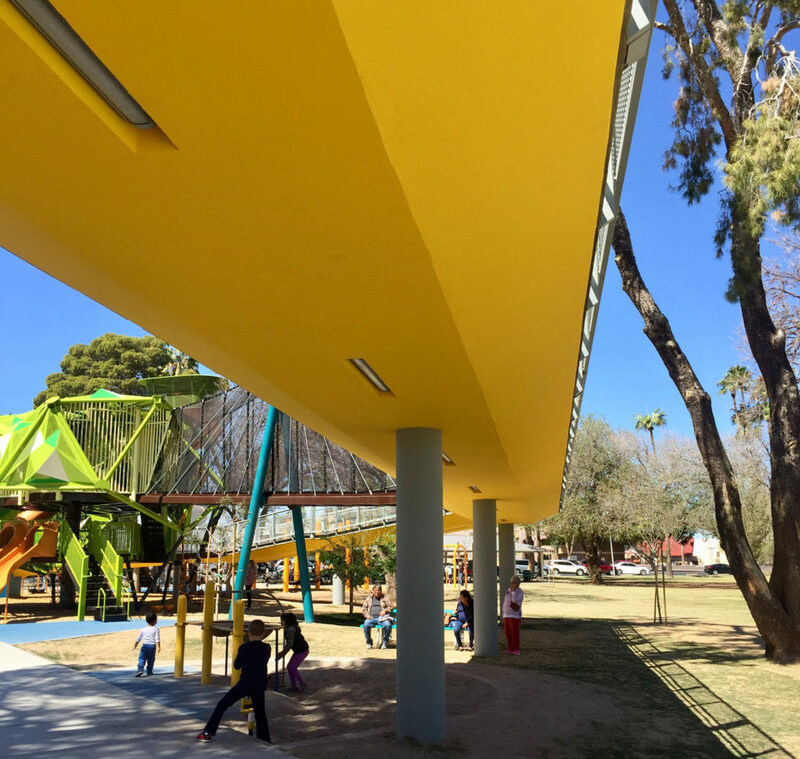 Restroom Design.